Accelerate productivity and business efficiency by combining the ease of use of social tools with the power of a structured hierarchy. The platform includes document check-in and check-out, version control, approval routing, metadata, taxonomy, document types and nested folders. Discover expertise and content using social analytics to support deeper customer and partner relationships. Find content and subject matter experts using social analytics, embedded search and social capabilities such as tagging, commenting and liking. Connect people to people and people to information, content and knowledge. Use in-context views of critical business activity to take action as new information arises. Activity streams with embedded experiences enable you to act on content without switching context. You can also engage people and drive initiative by embedding the collaborative content creation process into work streams. Build an engaged social business network by making sure you are curating content from trusted sources. 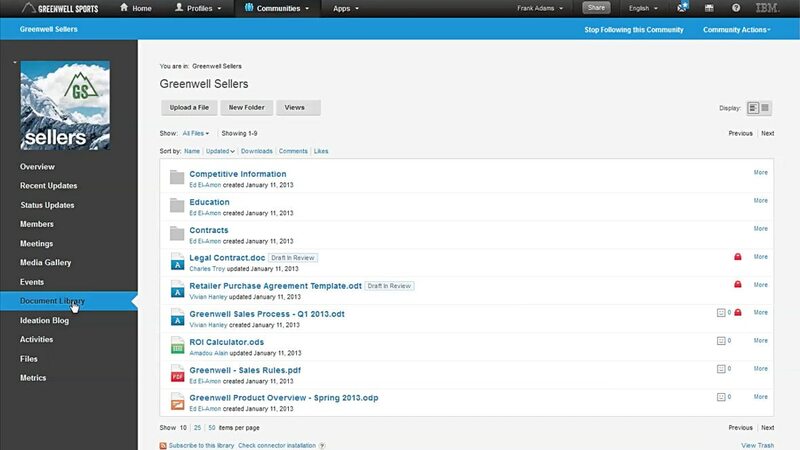 IBM® Connections™ Content Manager helps ensure the content you share is accurate and up to date. Business stake holders will engage and look to the network for reliable information that they can use to make decisions and drive your business.